The sign called to me, with a French accent no less, from an estate sale basement. I was putty in his enameled French hands? What to do with the sign? for the perfect mix of some of my favorite things. I have non other to thank but the amazing Kim for this fabulous idea! i have got the empties, now i just need a basket and a sign to call me madamoiselle and we will be all set. What a great find!! Love it, and I love what you did with it! Cute post!! 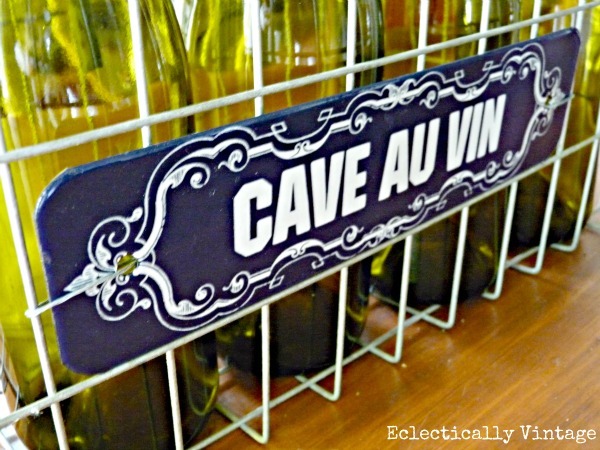 Forget the sign…I need a wine cave. Or tequila cave. Or a beer cave. Yeah, that’s it…a beer cave. I love your sign and thanks for the shout out. I would of been scared to hear French voices, they always remind me of the Pepe Le Pew cartoon. Love this Look Kelly. I loved it when Kim shared as well! Pretty pretty. Signs. Wine. Hydrangeas. All is right and good with the world! Lovely!! What a great find. Loved Kim’s sign and love yours too!!! The basket looks wonderful with the hydrangeas! Perfection indeed! Once again, I find myself coveting one of your new treasures! You really know how to find the good stuff! What a clever idea! 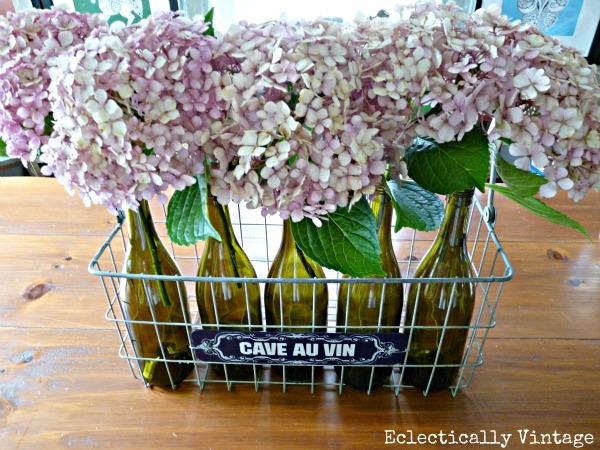 Love the hydrangeas in the wine bottles! Oh it looks so pretty!! Love the combinations. I can’t believe you found this great enamel sign in a basement estate sale! You lucky girl. What a find. Perfectly styled I must add. Looks gorgeous–makes such a big impact with all the colored bottles. mmm beautiful & i ADORE how you used it! score! Love it all! 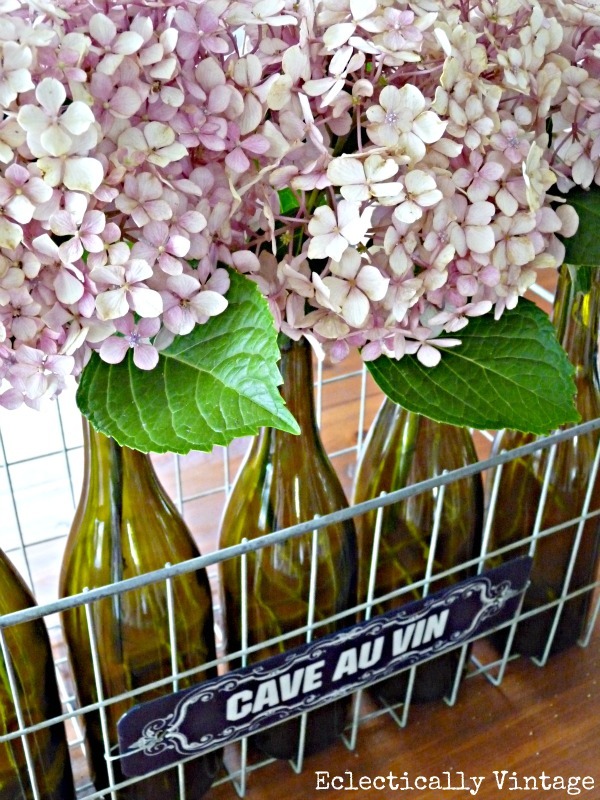 The sign, basket, bottles, flowers… perfection! 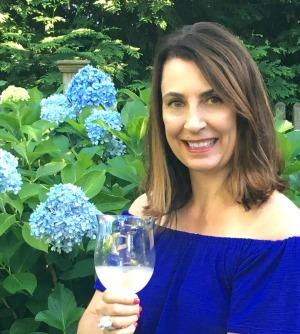 Wine and hydrangeas….definitely on my favorite things list, as well! Tres, tres belle, Kelly. Vin et fleurs!!! Came over from I Gotta Create. At least the voice was not singing Frere Jacques! All of my favorite things in one place!! It looks great all pulled together! So cute. I have the wine bottles just need to get some other things to do this. Love it! Too bad my Hydrangeas. are not looking so hot right now. Beautiful, Kelly! Thank you for sharing your fab find and creativity at Potpourri Friday! What a darling idea….love it!! i LOVE the whole creation! it’s AWESOME!!!! that an jersey accent on the AWE…some!!!! thanks for sharing over at Junkin Joe…you rock! Looks beautiful paired up with those flowers! Super sweet- I just love it! Wire baskets get me every time. Thanks so much for sharing at Get Schooled Saturday! Love this beautiful basket and sign. 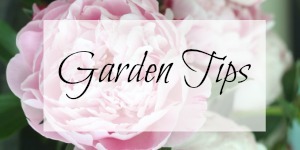 Your hydrangeas are the perfect finishing touch! Great photos, always love a basket, and oh yes, beautiful hydrangeas! thanks for always coming to link up at Vintage Inspiration!! Oh, I am loving this basket with the cute sign! Just lovely! I will be featuring this post on this week’s TTF party! I hope you will join us again and stop by to grab your “I was featured” button for your blog! Love the sign on the basket. It looks great. The sign and basket look great together, well done! This is one of my favs Kelly! I love these signs so much and what a perfect addition on the basket! So glad you shared it with the copy cat party. Would love if you added me little ole link with the rest of these wonderful parties you joined. I am getting ready to join your color party…just have to make a post. Oops – sorry I forgot! Will do right now Debbie!! 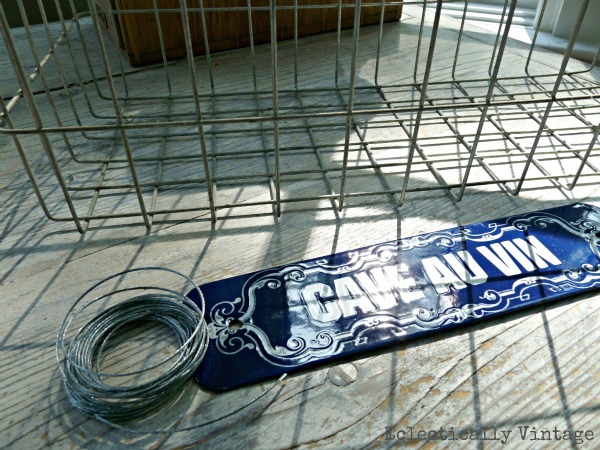 Cute idea, I love the sign and using the wire basket for wine, it looks adorable! I pinned it!